Damn Alessandra Torre, what a way to end a book and leave the reader desperately wanting the conclusion. From first to last page this book was fast paced, action packed, addictive and unputdownable. Suspense, intrigue and that ever present element of danger is prevalent throughout the pages as Alessandra Torre brings her A game with Even Money all while leading us into a false sense of security with one hot, fast and steamy love affair that will melt the coldest of hearts. Bell Hartley is a student and cocktail waitress at an underground casino and when her path crosses with Dario Capece her life changes forever. I adored Bell as a character, she had endured a lot and had come out of it stronger than most. She battled to make a life better for herself and in doing so had made some great friends. Bell stood up for what she believed in and that ultimately led her to the job she has now, where her bosses are like protective brothers and ultimately, they are a little family in itself. Dario Capece is one of Vegas’s richest and most influential men, only bettered by his father-in-law. Dario is powerful, enigmatic, possessive and protective, many traits that book boyfriends are made of and I bet a lot of hearts are won with this duet. Again, his background is not great, but he did what was needed to make his life a better one, while making it infinitely better for the small few he surrounded himself with. Bell knew what she was walking into, she knew that he was off-limits, but the heart wants who the heart wants, a fact only exacerbated when it is reciprocated. Bell’s heart was a fortress, one that she had armoured and protected with every fibre of her being and even she couldn’t understand how Dario Capece had invaded it. Dario was the same, he had never fallen in love, he protected himself against it to protect those closest, but even he was fighting a losing battle. Trouble with Vegas though is everywhere has eyes and ears, nowhere is safe, even when you think you are being smart and clever. You never know a story until you have heard both sides, assumptions are made, often the wrong ones. People are unhappy, people know nothing, people think they know everything, but how far will they go? Murder? Alessandra Torre nails this one and as I said above only leaves the reader in a state of desperation, salivating for the next and final book, Double Down, which releases on June 18th. The character connection was on point, the chemistry was seriously sizzling and the connection that these two had was palpable. 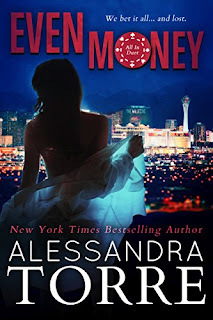 However, this is classic Alessandra Torre and one thing I have come to expect when she writes using her suspenseful side is to expect the unexpected and that certainly rings true with Even Money. The queen of curveballs throws a doozy with this book and this catcher never saw it coming. Bravo and bring it on, the bases are loaded.